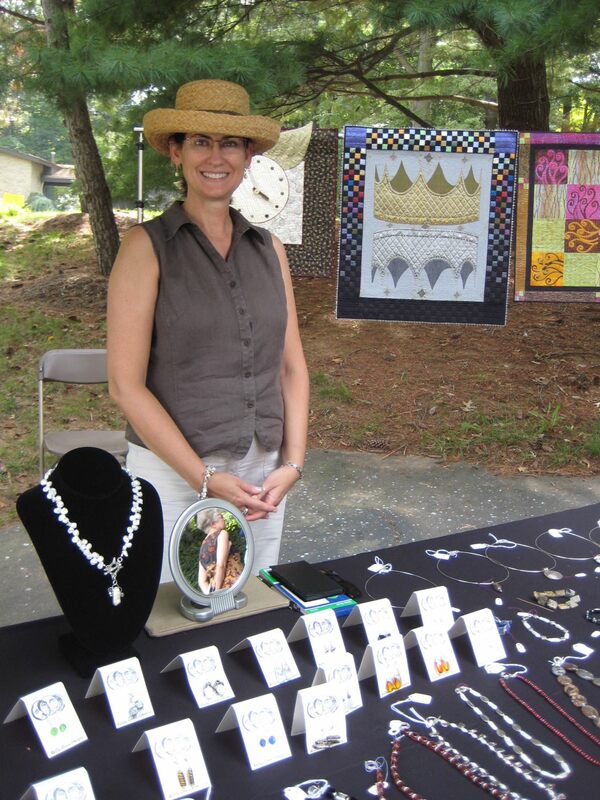 On Sunday, our neighborhood held its annual Art in the Park, featuring artists from throughout the neighborhood. It was great to see so many people braving the sweltering heat and connecting with their neighbors. It was hot, hot, hot, but everyone was in good spirits. Our neighbor Ferris Kaplan took this shot of me in my booth. Thanks, Ferris! For those of you who only know me as an art quilter, I should confess my addiction to making jewelry. I love playing with all of the beautiful components, combining colors and materials in the never-ending quest to create something new and unusual. I love pearls and silver. I like other things too, but I’m always drawn back to pearls and silver. And so, I take breaks from quilting to make jewelry…and I take breaks from making jewelry so that I can quilt. It’s all good. The artist in the red tee shirt is my friend Judy Gula. She had a table full of her funky and unique jewelry, hand-stamped bookmarks, and fabric-covered journals and sketchbooks. In this picture, you can almost see her wonderful denim skirt with red Lonni Rossi fabric added. In a past life, her skirt was a pair of jeans. I really need to learn how to do that!Judy is such a creative soul and I’m so happy to live close to her. It is dangerous, however, since she sells everything the art quilter could want or need and she can sometimes deliver my fix of Angelina or Stewart Gill paint. Does that make her an enabler? Hmm. I hope not. Would you like to buy some furniture? My husband Eric (in the straw hat) came into possession of some wonderful aged barnwood and made some lawn and patio furniture, birdhouses, and squirrel feeders. (Really, they’re more like torture devices for the squirrels, who are forced to think harder than usual.) I love how the barnwood makes everything look as though we’ve had it forever! I’m thrilled that he had some stuff left at the end of the day so that we can use the tables and planters here at the house. 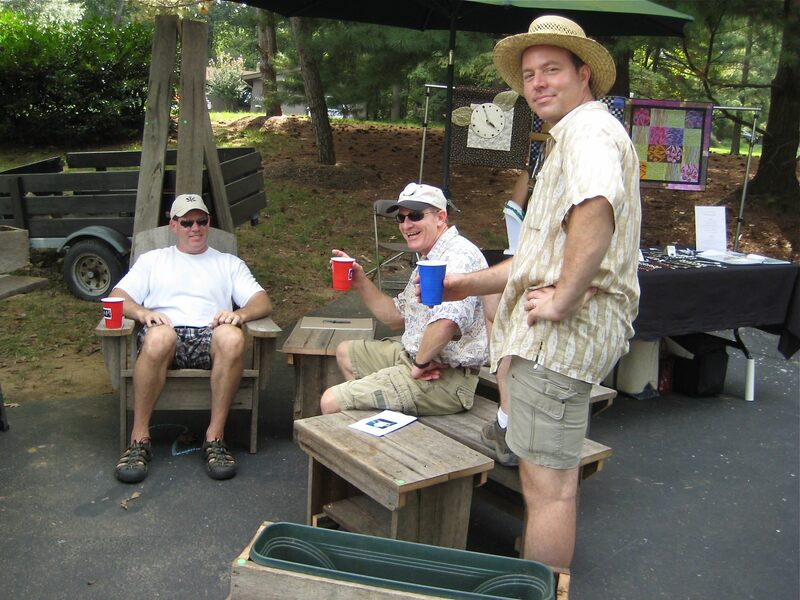 You have to have somewhere to sit your beverage while you’re playing horseshoes! Bonnie! 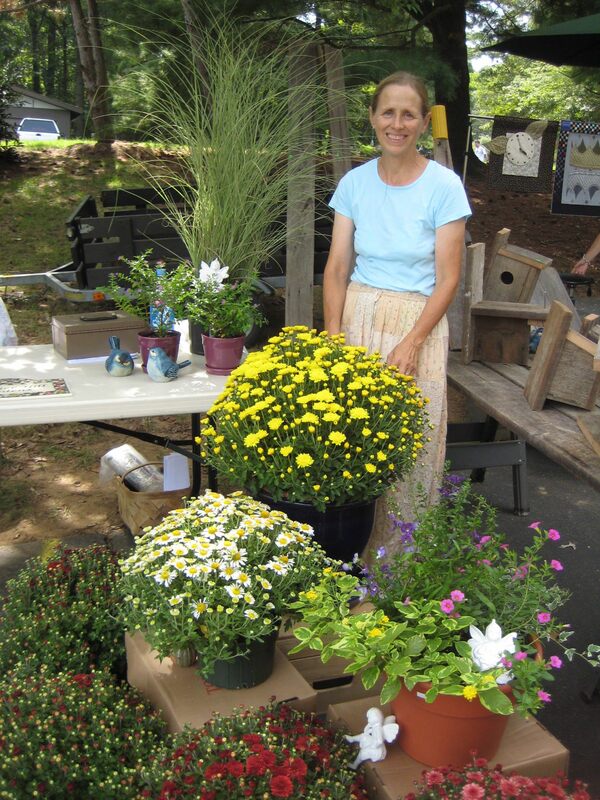 Bonnie owns Heather Hill Nursery, where you can find the best and most creative stuff for your garden. Even through the temps were in the high 90’s, you could almost feel autumn coming with all those mums! Soon, she’ll have all of her pumpkins and her maze for the kids to navigate. I love visiting her nursery because she always has something I’ve never seen before. In fact, my deck and patio planters are beautimus because of Bonnie’s plants and expertise. Bonnie is a quilter. I wonder if the quilting helps her develop her eye for color in plantings or if the beautiful plants help her in her quilts? Either way, it’s all good. I believe the most original thing I saw at the show was one neighbor who is doing amazing things with recycled newspaper and lamination. Way cool! You never know what you’re going to see. It’s Time for Art in the Park! I just love my neighborhood! Last year at around this time, I blogged about Art in the Park and it’s time to do it again. This time, I thought I’d give you advance notice in case you’re in Northern Virginia and you want to attend. 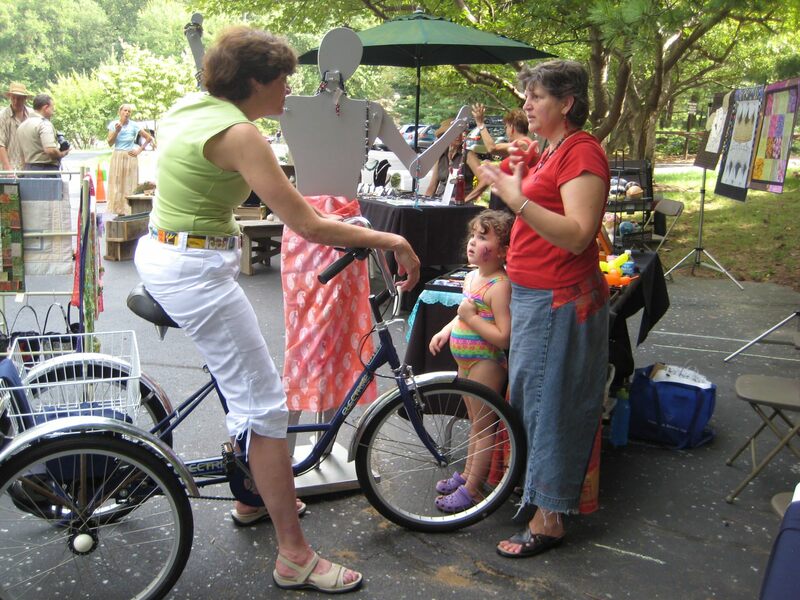 This Sunday, there will be 33 vendors setting up their tables to entertain and entice our neighbors. Most of the vendors live here in Truro; it’s a great way for neighbors to get to know neighbors. And do you know what else? It’s a great chance to knock out some holiday shopping. Okay, that was blatant self-promotion, but I will have a table of my handmade jewelry (and a few quilts) and my husband will have a table of things for the yard and patio made from reclaimed barn wood. Judy Gula from Artistic Artifacts will be there with treasures for the fiber artist and Bonnie Ruetenik will be there with lots of garden goodies from Heather Hill Nursery. If you’re in the neighborhood, stop by and say hi! 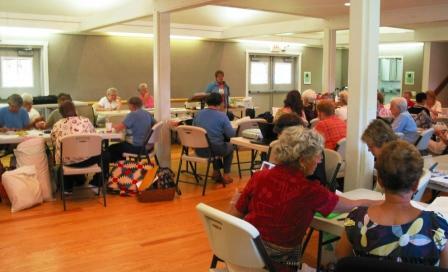 Today, I had the pleasure of speaking to the Tavern Quilt Guild in Heathsville, Virginia. What a wonderful group of ladies! They were friendly, welcoming, and full of questions. I presented a new lecture: It’s Okay to Write on Your Quilts. We explored different ways to add writing to your quilts and I showed them lots of quilts and quilt pictures with different types of writing in the designs. One quilter even chose to bring a quilt to show and tell that had writing on the fabric! What a great way to spend a day!